The human life starts with an important phenomenon of Vrana. The healing process of Vrana is a natural process which also starts immediate after injury. Sushruta described Vrana at different places in different context. Though the pattern adopted by him is very precise and enough sufficient, but one has to observe another part of the treatise to understand the further consequence of Vrana at different places. Therefore, it is a need to simplify the concept of Vrana on different aspects and recollect it at a place. The aim of this monograph is to make the concept more simple and understandable to the students. This book will be useful for the students, surgeons and other scientist. This Monograph is divided in following chapters as Introduction which also include historical, review where a mile stones of Vrana could have been tried to establish. Ayurvedic view of Vrana has been elaborated. Modem aspect of Vrana (wound) is also summarized in nut shell. In last, the work performed in the department of Shalya Tantra IMS, BHU is listed along with their workers and supervisor. Dr. Lakshman Singh is born in V/o Manpur Rampur, Bulandshahar U.P. He obtained BAMS (Delhi University), Dip. Yoga, and MS (Ay) and Ph.D. from B.H.U Dr. Singh completed 2 yrs course (MRAV), New Delhi. He is working as Sr. Lecturer in Shalya Tantra, IMS BHU. He has almost 19 yrs experience in Shalya Tantra. He has supervised 13 MSIMD (Ay) and published more than 25 papers and articles in National level journals and magazines. 4 National awards have honored him for his credit in teaching and working in Shalya Tantra e.g. Young surgeon (Ayurveda) award as Sushruta Ratna 2001 by National Sushruta Association, National Service Award 2002 by All Indian Ayurveda (P. G.) specialist. Association, New Delhi and Jeevak award by Govt. Ay. College, Patna. Dr. Singh has been awarded as a Best Ph.D. thesis award-2006 by RSRI Sandeela, U.P. in the conference of UP chapter of NSA & 13th foundation day of RSRI. Dr. Singh has published one book’ on Poorvakarma Therapy in surgery, 3 chapter in book attended 65 conferences and presented 26 papers in National and International conferences. It is a matter of pleasure to write the foreword of monograph Concept of Vrana authored by Or. Lakshman Singh. This monograph is based on the ancient texts of Ayurveda and clinical work performed in the department of Shalya Tantra under the supervision of senior teachers like Prof. P.J. Despande, Prof. L.M. Singh, Prof. K.R. Sharma, Prof. G.C. Prasad, Or. S.N. Pathak, Prof. M. Sahu and Or. Lakshman Singh. This monograph discusses the details of the concept of vrana in various texts. It highlights the definition, aetiopathogenesis, classification and manifestations of vrana. The management of vrana has been summarized in a nutshell. The modern concept of vrana including definition, causes, pathology, clinical features and management have also been correlated. Vrana and its management are of prime importance in surgical practice. A surgeon essentially creates a wound which he has to manage accordingly by different methods. Generally, a vrana created by a surgeon is considered as clean which heals by primary intention, but there are many other types, which follow secondary or tertiary stages of healing. Some wounds are difficult to manage and are considered anon-healing ulcers. All these factors speak for the importance of vrana in surgery. Sushruta hasemphaciized that vrana was the first disease with which a human being ever suffered. He has quoted the examples of Devasur Sangram and reimplantation of Dakshas head by Ashwini brothers after he was be headed by shiva. The life of a new born also begins with vrana when he needs surgical care of umbilical cord till is fully detached and healed. Therefore, the topic chosen by the author’ concept of vrana’ is appropriate and will be useful to the students of Ayurveda undergraduate and postgraduate level. It is appropriate time that this monograph is coming out of the press. The author of this monograph Dr. Lakshman Singh deserves congratulations having brought out such an illustrative work. Dr. Lakshman Singh is working as senior lecturer in Shalya Tantra, Faculty of Ayurveda, Institute of Medical Sciences, BHU. It is hoped that this book will be highly received by scholars and practioner of Shalya. I hope many more such useful contributions from the pen of this young writer in future. Vrana is considered as an important concept in Shalya Tantra. It denotes the discontinuity of body part Varna Gaatravichurnane, Varnayateeti, It is called as ‘VRWA’ because it causes damage and discoloration. The word ‘VRANA’ being derived from the verb-root ‘vrana gatravic-hurnane’. Father of Indian surgery Sushruta gave the importance of vrana at the onset of text while explaining the definition of Shalya Tantra. The goal of Shalya Tantra is to make the man free from disease and maintance of health. Vrana is a natural phenomenon of human life. Therefore, the concept of Vrana was decided to review the ideas of various scholars. We receive numbers of patients of different types of vrana in routine surgical practice. Many of them heal up well in normal course of time but approximately 1/4th of them Vrana refuse to heal due to their natures, D.M., T.B., Malignancy, AIDS and vascular causes etc. In ancient text, also there are different types of vrana’ which have same features, known as Dusta yrana, Krichha Sadhya and Asadya Vrana. Sushruta described in detail the causes, pathogenesis, clinical features and management etc. The description regarding Vrana in Sushruta Samhita is enough but it is at different places. 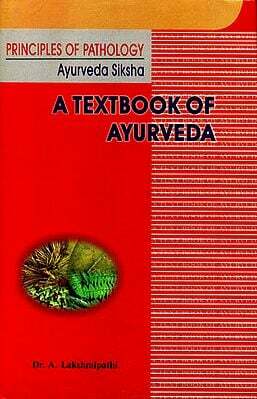 There was a need to collect the all ideas of Sushruta and other scholars of Ayurveda to correlate with modern views. Now science and technology has developed up to great extant, there are various advancement in diagnosis and management of vrana. Therefore, efforts have been made to review the ideas from various sources and systematize. The concept of Vrana (wound) is as old as human life. The earliest reference of vrana is found in Vedic literature in context of injuries. Basic concept of wound cleansing, closure and splinting has been described in various medical systems. Healing is a physiological phenomenon of regeneration and repair after injury. It is a natural biological process, as wound elicits a consistent response in the body. 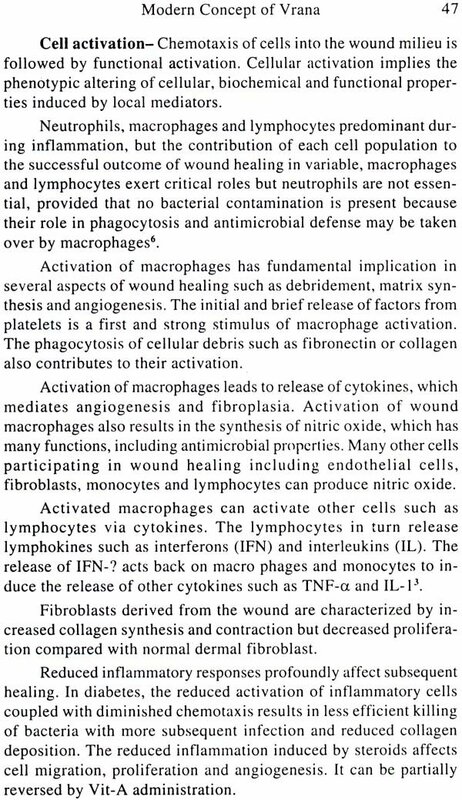 This process begins as an inflammatory response. The process is dynamic and each wound predictably moves down a common pathway of healing. Once the clinician seeks for consistent progression of healing, the treatment course can be projected and predicted. As the sequence of wound healing unfolds organized management i e meticulous debridement, dressing and systemic management are only keys for successful wound healing. Ayurveda is a science of life and there is very vivid description of vrana, its classification and management including various local and systemic measures. 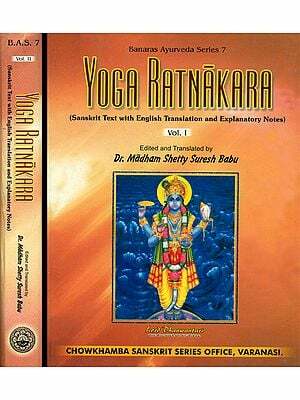 Three great treatise (Brahatrayi) viz., Charaka samhita, Sushruta samhita, and Astanga hridaya have elaborative descriptions regarding vrana. Sushruta (1000 BC) ‘Father of Indian surgery’ had compiled the surgical procedures in his treatise Sushruta Samhita. He emphasized the concept of Vrana, its aetiopathogenesis, various types and management. He had formulated sixty procedures for the management of vrana along with numerous drugs. The principles and procedures for management of wound described by Sushruta are still very much in practice. A lot of work has been carried out on wound by various worker and results are encouraging. Wound Infection is one of the most important factor which delays healing and is also responsible for the formation of dushta vrana. In order to accomplish satisfactory healing of dushta vrana, it is necessary to get rid of infection. Sushruta was well aware about this type of complications. He described number of drugs for management of vrana which are broadly classified into vrana shodhana and vrana ropana. Both the groups have been classified therapeutically under seven headings viz. Kashaya, Varity, Kalka, Sarpi, Taila, Rasakriya and A vachoornan. He advocated external application of kashaya of various drugs used for vrana shodhan and ropan process. As healing process is a natural phenomenon which starts right after trauma and continues in sequential manner till the formation of healthy scar. But this normal phenomenon is not uniformly present as a rule under different conditions of wound. Some general factors like nutritional, hormonal, systemic disease, environmental conditions and local factors like slough, infection, blood supply, foreign body etc. These factors either alone or in combination retard and influence the normal sequence of wound healing process. A clean wound heals earlier with a minimum scar as compared to a contaminated wound. The healing of infected wound is a great problem particularly in cases of ulcers of vascular origin, tubercular ulcers, tropical ulcers etc. Although a lot of works have been already perform by many workers but these have also some limitations like cost effectiveness, insufficient availability of material and modality in rural areas. Nearly 80% population of India resides in rural areas which have poor hygiene and nutritional status. Wound in these people take longer time to heal as it gets infected due to their negligence and lack of healing factors. Therefore a need was felt for such a modality which should be easily available with minimal cost to the general public. Some drugs like Surasa, Karveer, Aragvadha, Nimbadi Tail and Tiktadi Ghrita etc are found very effective as healing and debridiing agents and have shown encouraging results. In the present concept of wound, all efforts have been made to keep the wound clean during the various stages of healing. Such cleaning process is called vrana shodhana (debridement) in Ayurveda. Apart from local shodhan, internal shodhan like aptarpana, snehana, swedana, vamana, virechana, and basti etc are also equally important to maintain the dosha in equilibrium. The debriding methods used nowadays are surgical, chemical and mechanical debridement. An ideal debriding agent should not damage to surrounding healthy tissue of a contaminated wound, should not have any undesirable effect and at the same time should be capable of performing debridement effectively. This monograph is designed to high light the concept of Vrana from the derivation of word vrana, definition, historical review, aetiopathogensis, clinical features, management, prognosis and complications from both point view i.e. 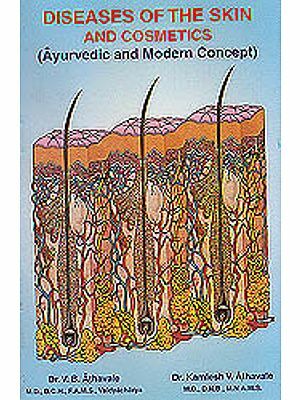 the Ayurveda and modern medical science. The clinical and experimental work on vrana, performed under the supervision of eminent scholar of Shalya Tantra department has been summarized to show the efficacy of different Ayurvedic remedies. Work performed in the Department of Shalya Tantra, B.H.U.